Mile 19 - Early Autumn along the Towpath. Mile 16.6 - Approaching Swains Lock. This is probably the most heavily used section of the canal. Generally, the towpath here is in excellent condition, and the canal basin still contains water. In April 2006, after more than 30 years, the Widewater towpath breach (between mile 12.6 and 13.7) was finally repaired (much rejoicing!). As a result, you no longer need to carry your bike up and down the stairs to use the Berma Rd detour (although this is still a nice alternative route). 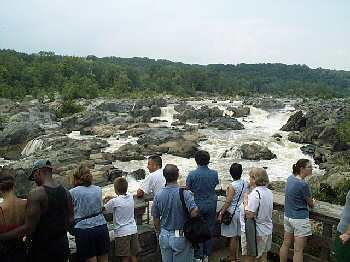 The major point of interest in this section is Great Falls, located at mile 14. During nice weather, this area is crawling with folks out to enjoy hiking on the challenging Billy Goat Trail, rock climbing in Mather Gorge, kayaking in the Potomac rapids below Great Falls, or just enjoying a stroll along the towpath. Use caution and be courteous around the pedestrians. Once you pass Great Falls, the towpath quickly becomes less crowded. Swain's Lock is a nice place to stop for a break. At mile 22.8 are the remains of the Seneca Creek Aqueduct. This three arch aqueduct is the first of eleven such structures along the canal. The western most arch was destroyed by a local thunderstorm flood on Sept 11, 1971. 10.4: Carderock - about 1 mile from beltway. Follow signs to recreation area. 12.6: Old Angler's Inn - follow Clara Barton Pkwy to end (at tee) Make left on to MaCarthur Blvd. Parking available about 1 mile ahead on left, across the street from the Inn. 14.3: Great Falls (fee area) - continue about 1 mile past Old Angler's Inn. Park entrance is at the top of the hill. 16.6: Swains Lock - left turn about a quarter mile west of the Piney Meetinghouse Rd intersection. Look for Swains Lock mailbox. 19.6: Pennyfield Lock - left turn about 100 yards past the Travilah Rd intersection. 13.0 Bill Goat Hiking Trail A South Entrance: Excellent 1.7 mile hiking trail along Mather Gorge. Rejoins towpath at Milepost 13.8 Recommended if you have time, but strenuous. No Bikes. 13.8 Widewater Stop Lock This structure is used to prevent flood damage downstream. Provides access to Berma Rd, via stairs. 13.8 Bill Goat Hiking Trail A North Entrance: Excellent 1.7 mile hiking trail along Mather Gorge. 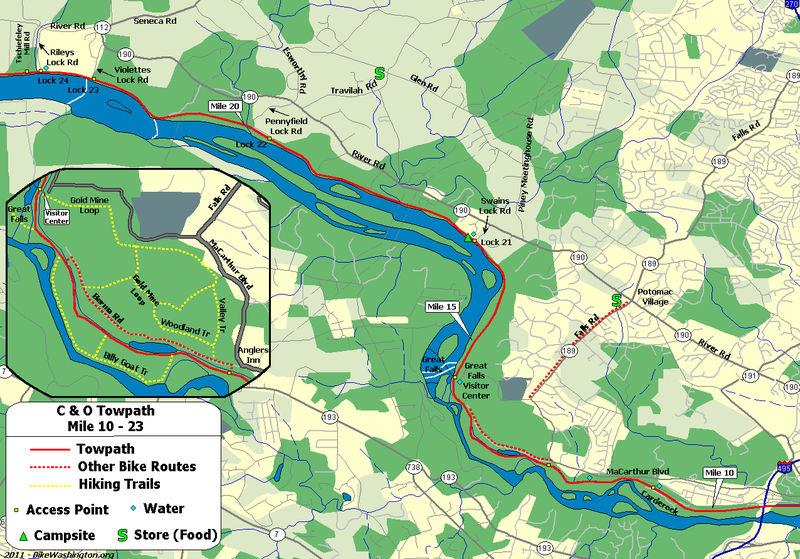 Rejoins towpath at Milepost 12.8 Recommended if you have time, but strenuous. No Bikes. 13.9 Mary's Wall 75 foot wall down to river. Provides overlook to Mather Gorge. During big floods, the river rises about 10 feet over the towpath at this point! 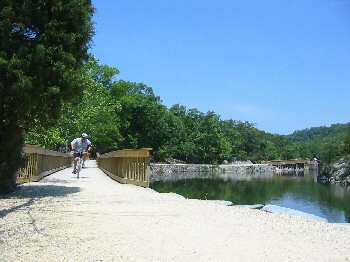 14.0 Great Falls Overlook (map) Follow footbridges 1/4 miles out to overlook. Sorry NO BIKES allowed. Bike racks available. 21.0 Blockhouse Point cliffs Towpath extends out into the river while passing some scenic cliffs. 22.8 Seneca Creek Aqueduct The first of eleven aqueducts along the towpath. The north arch was destroyed in 1973 by a thunderstorm flash flood.